darkSpyro - Spyro and Skylanders Forum - Spyro: Adventure / Attack of the Rhynocs - What is a momkey? darkSpyro - Spyro and Skylanders Forum > Spyro: Adventure / Attack of the Rhynocs > What is a momkey? There is no momkey!Is there some weird glich I should know about? I wanna know how to get to momkey!Soup sounds fun! If I don't find out I'm gonna EXPLODE!!!!!!!!!!!! Where did you here about the momkey? If you heard about it from other kids, it must be a false rumor. Momkey was a puzzle that was to take place on a separate map called Momkey's kitchen, which included a large eating area with many monkeys seated at tables. Spyro's job was to help Momkey serve her renowned soup to the monkey workers. 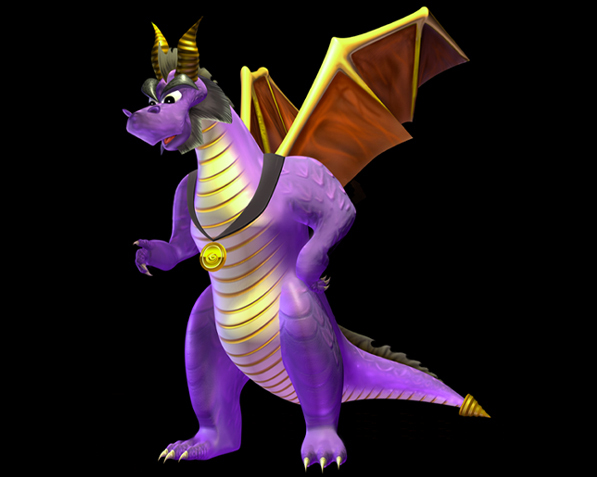 Spyro would approach Momkey to acquire a bowl of soup, which he would balance on his head. If Spyro charged, he would spill the soup and have to go get more. Spyro would have to take each bowl of soup to the monkey workers. The workers would be visibly impatient and demanding of more soup and, if a monkey worker didn't get very good service, he would spaz out completely and you would have to start the challenge over again. The challenge would have been timed, in that you had to serve soup during the entire lunch rush of probably one to two minutes (not much of a lunch break for the poor monkeys). It's sort of like Tapper, really, but in two dimensions instead of one, and you didn't have to return the emtpy bowls (at least, I think you didn't have to return them). It's a shame that puzzle didn't make it in. It seemed as though it would be fun to play. But as hard as everyone worked on that project, there just wasn't enough time to get everything in. There never is. Thanks! Too bad they didn't get it in the game...It sounds kinda fun. I remember the discussion about Momkey. That was ages ago!